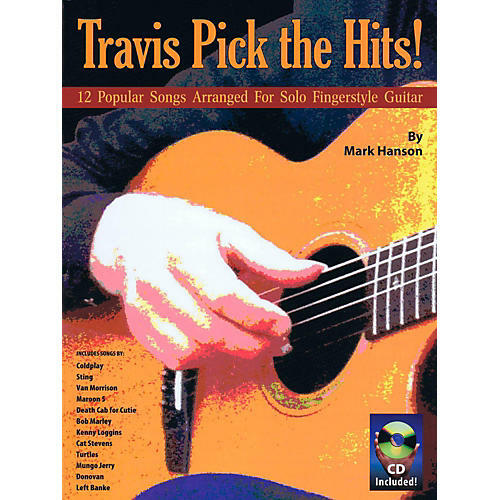 Travis-picking is a fingerpicking style that uses on-the-beat, alternating bass patterns picked by the thumb to support treble notes picked by the fingers. This book presents a dozen classic songs from a variety of genres and eras arranged beautifully in this distinctive style for intermediate to advanced fingerpickers. Songs include: Fields of Gold • Clocks • Happy Together • Brown Eyed Girl • House at Pooh Corner • Moonshadow • She Will Be Loved • In the Summertime • I Will Follow You Into the Dark • Jennifer Juniper • Walk Away Renee • Three Little Birds. The accompanying CD is a full-length, stand-alone listening recording. “I keep running into folks who have attended your camp and they play great arrangements that you taught them. Well done, Mark!” –Pete Huttlinger, national fingerpicking champion.